An anonymous and voluntary online survey was administered to Wellington-Dufferin-Guelph (WDG) residents between June 7, 2018 and July 8, 2018. It included questions about attitudes toward cannabis use, knowledge of the health effects of cannabis, interest in using cannabis once legal, current cannabis use behaviours, and impacts of cannabis use. Over one-third of respondents indicated that they had used cannabis in the past year. This finding is higher than recent Canada-wide surveys that suggest that approximately 15 to 22 percent of the population has used cannabis in the past year. Among respondents who reported that they have not used cannabis in the past year, over half of them reported they are not likely to try cannabis once it is legal in Canada. Most respondents believed that cannabis use was beneficial, socially acceptable, and it would be easy for them to access cannabis in the next 24 hours. The survey identified various knowledge gaps around cannabis use and its related harms. People who had used cannabis in the past year were less likely to know about the health effects of cannabis compared to people who had not used cannabis in the past year. In June 2018, the Federal government passed Bill C-45, the Cannabis Act, which legalizes, regulates and controls the production, distribution and sale of cannabis and allows adults to legally possess cannabis. The goals of the Cannabis Act include: keeping cannabis out of the hands of youth, keeping the profits out of the hands of criminals, and protecting public health and safety by allowing adults access to safe and legal cannabis.1 Cannabis became legal in Canada on October 17, 2018. 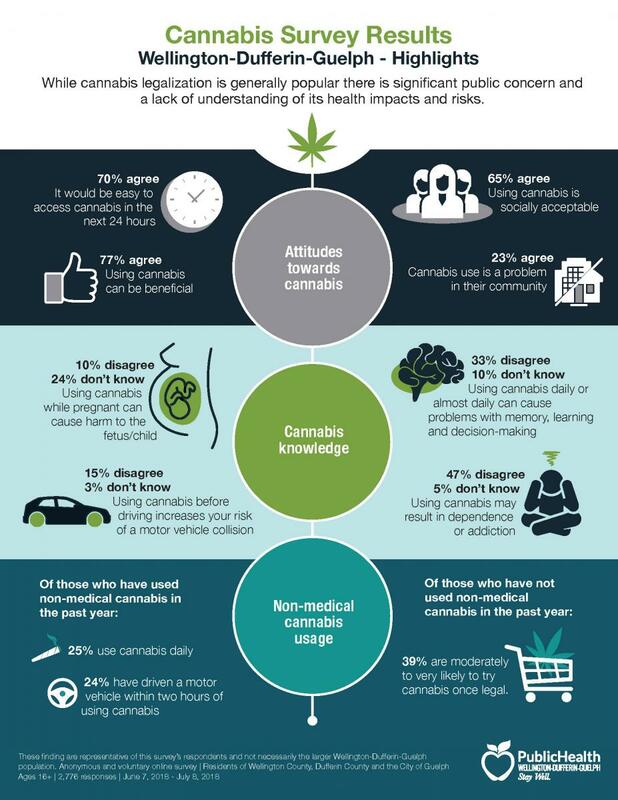 To fill this information gap, Wellington-Dufferin-Guelph Public Health (WDGPH) administered a survey in June of 2018 to gather baseline information about people’s attitudes towards cannabis, their knowledge of its health effects, their interest in using cannabis once legal, their cannabis use behaviours, and the impacts of cannabis use on current users. This information will serve as a baseline to compare with surveys conducted in the future, to assess the impacts of the legalization on cannabis use patterns. Additionally, the information can be used by WDGPH and community partners to guide the development of educational resources and interventions to address the potential impacts of cannabis legalization. An anonymous and voluntary online survey was administered to WDG residents ages 16 and older between June 7, 2018 and July 8, 2018. Respondents were recruited using online and print advertising, and the survey was promoted through local media. Targeted advertisements were used to increase the response rate among underrepresented communities. After the survey results were collected, responses were weighted using local census data for age, education and gender to make the sample more representative of the WDG population. Responses from people who have used cannabis in the past 12 months (cannabis “users”) were compared with responses from people who have not used cannabis in the past 12 months (cannabis “non-users”). Results were analyzed to determine if differences between these groups were statistically significant. Individuals could choose whether or not to participate in the WDG Cannabis Survey, so respondents were not a random sample. Results should be interpreted with caution, since individuals who chose to participate may be different than individuals who chose not to participate. A total of 4,073 survey responses were received, of which 2,776 were valid and complete. The sample included a high proportion of females, people who have completed a post-secondary education and people 20 to 39 years of age. Table 1 shows the demographics of respondents before and after weighting to match local census data. Participants were asked how much they agree with a series of knowledge-based questions about the health risks associated with using cannabis. Table 2 shows the percent that agree among all respondents, among people who use cannabis and among people who do not use cannabis. Note: Table includes people who ‘strongly agree’ and ‘somewhat agree’. Note: All differences between people who use cannabis and people who do not are statistically significant. The majority of respondents were not able to identify the correct response. For most statements, fewer than two-thirds of respondents agreed with the correct response. For example, only 38.2% of respondents agreed that cannabis smoke has the same cancer-causing chemicals as tobacco smoke These results highlight the importance of WDGPH and partners improving knowledge about cannabis use. People who had used cannabis in the past year were less likely to identify the correct response than people who had not used cannabis in the past year. This was most evident for the statements about cognitive and mental health impacts of cannabis use. It is particularly important that cannabis users have accurate information to inform their behavior. Respondents were also asked if they had heard of Canada’s Lower-Risk Cannabis Use Guidelines, developed by the Centre for Addictions and Mental Health (CAMH). The guidelines include ten (10) evidence-informed recommendations which suggest ways to use cannabis more safely. Most respondents (87.2%) indicated that they had not heard of these guidelines. Participants were asked how much they agreed with a series of attitude-based questions about cannabis. 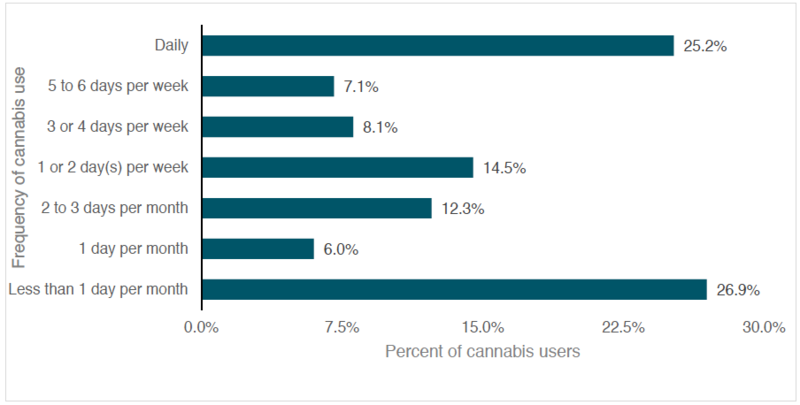 Table 3 shows the percent that agree among people who use cannabis and people who do not use cannabis. Most participants believed that cannabis use can be beneficial, that it would be easy for them to access cannabis, and that using cannabis is socially acceptable. These results highlight opportunities for WDGPH and partners to promote healthier attitudes toward recreational cannabis use. In contrast, few respondents agreed that they see advertisements for cannabis regularly (26.4%), or that cannabis use is a problem in their community (22.9%). Attitudes differed between people who had used cannabis in the past year, and people who had not. Cannabis users were more likely to agree with positive statements about cannabis (e.g. “Using cannabis can be beneficial”) and less likely to agree with negative statements (e.g. “Cannabis use is a problem in my community”). Additionally, 15% of cannabis users indicated a willingness to share cannabis with an underage person, in contrast to less than 3% of cannabis non-users. Over one-third of respondents (38.3%) reported using cannabis in the past year. This proportion is much higher than recent Canadian-wide surveys that suggest approximately 15 to 22 percent of the population has used cannabis in the past 12 months. 5,6,7 Many of these respondents reported using cannabis either less than one day per month (26.9%) or using cannabis daily (25.2%). (Figure 2). Figure 3 shows the frequency of cannabis use among respondents who used cannabis in the past year, by age group. Daily cannabis use was highest among respondents aged 30 to 39 (34.2%). Note: Total for each age group may not add up to 100 percent due to rounding. Among respondents who reported using cannabis in the past year, almost one-quarter (24.3%) reported that they have driven a motor vehicle within two (2) hours of using cannabis. Over half of respondents that had not used cannabis in the past year (55.4%) reported that they are unlikely to use cannabis once it is legal in Ontario. These respondents were less likely to express an interest in trying edible cannabis products once legal, compared to respondents who already used cannabis. Respondents were asked to indicate their preferred ways to receive useful and accurate information to them about cannabis. Table 3 shows the top communication methods reported by respondents. The preferred way to receive cannabis information may not correlate with the most accurate as the cannabis industry has a direct conflict in providing this information. This may indicate that the cannabis industry is providing the preferred source of information about cannabis which is a concerning trend. Note: Total percent does not add up to 100% as respondents were able to select more than one response. The WDG Cannabis Survey recruited 2,776 valid and complete responses, which were weighted to be more representative of the WDG population. Over one-third of respondents reported they had used non-medical cannabis in the past year. Based on other Canadian cannabis surveys this number is expected to be between 15 and 22 percent, suggesting this survey attracted a high number of people who use cannabis. Cannabis smoke has many of the same cancer-causing chemicals as tobacco smoke. These knowledge gaps are an opportunity to offer targeted and accurate information to the public to promote safer cannabis use. Survey results informed the focus and key messages of the recent ‘Talking About Weed’ awareness campaign. WDGPH will continue to use the survey results to shape programs and services to reduce cannabis-related harms. Baseline data collected in this survey can be compared to data collected in future (post-legalization) surveys to assess the impacts of cannabis legalization. WDGPH will also share survey results with municipalities and health and social service providers to help inform community policies and programs relating to cannabis use. Goal: Public health practice responds effectively to current and evolving conditions and contributes to the public’s health and well-being with programs and services that are informed by the population’s health status, including social determinants of health. There are several populations that are more vulnerable to cannabis-related harms. People aged 15 to 24 years of age are more likely to use cannabis and they are more likely to experience cannabis-related harms as their brains are still developing.9 Youth who begin using cannabis regularly at a young age are at an increased risk for developing an addiction, mental health issues and learning and memory problems.8,9 This could be of concern in WDG as the survey results show that age of first use of cannabis peaks at 16 years of age, and youth are using cannabis more frequently on a weekly basis (i.e. 1 to 6 days per week) compared to older age groups. Portions of the recent ‘Talking About Weed’ awareness campaign address high-risk groups, including youth, people who are pregnant and people with personal or family history of mental illness. Moving forward, communicating survey results internally, with community partners and the public will allow for more targeted health promotion communication and improvements to programs and services for these high-risk groups. Lastly, continued monitoring of cannabis use patterns among these high-risk groups will assist with understanding how cannabis legalization will impact them. While cannabis legalization is generally popular there is significant public concern and a lack of understanding of its health impacts and risks. 36% are moderately to very likely to try cannabis once legal.